So I thought it necessary to urge the brothers to go on ahead to you, and arrange in advance for this bountiful gift that you have promised, so that it may be ready as a voluntary gift and not as an extortion. Sometimes it is surprisingly simple to be the Church. It’ doesn’t cost a lot some days; a few hours, some hot cocoa mix, folks bring a few freshly picked apples, a bag of oranges, and we reuse our coloring tablecloths, a few favorite games, and a kickball. I’ve got a whole room full of books on theology, Biblical Studies, Adaptive Leadership, Church Revitalization and Narrative Family Therapy, but you know, sometimes it comes easily to be the People of God, partnering with the Holy Spirit’s work in the world. Yesterday we had another pop-up event in Alhambra Bark in the Woodbourne-McCabe Neighborhood, and it was easy. Our own Macy made delicious cookies, and she and her brother’s, along with her parents Sam and Leigh, played one of the most inspired games of Kick-Ball I’ve seen in years. Tom and Linda came by to chat with folks, and along with Joy reconnected with friends from Summer camp, we were the Church with our neighbors down the road. Sometimes, being the Church of Jesus Christ, it doesn’t take a whole lot, but it means the world to us, and the people we are blessed to be with. We are a community, rich in relationship. We are a community of folks willing to invest our time in showing up to be with folks. I loved watching what happened yesterday, as folks from Govans and Maryland, and the neighborhood showed up, and our table began to overflow with food, with bananas and oranges, apples and grapes, the food that just kept coming in the park. Yesterday, I saw our community give beautifully of itself, not in a way that was condescending, not some kind of white-savior experience, but one of genuine relationship, and investment in what God is doing in the world. Sometimes, we have all we need to be with the People of God, to equip the Saints in our midst to be and become who God has dreamed of them being since before She laid the foundations of the Earth. After yesterday, I am still full of life, still full of gratitude, still full of Thanksgiving for what God can bring about from what we are so rich in. I got to tell you, it’s hilarious to me that yesterday, on my day off, I got to play, and it was my job. You paid me to play kickball, to be hugged by children, who were excited for us to come back. My sacrifice of Play yesterday, it was an offering I was excited to give, something that enriched me. Sometimes, being the church, getting to be a part of it, is a gift to us, much more than what we give. And this, to me, seems to be the key to being a good steward of our resources as a Church. When it works, what a beautiful gift it can be to us to give. What a beautiful reversal takes place, where those who, by the measures of the world, should have all the power, with our wealth, and social power, are suddenly the student’s of what Jesus is up to in our world. Last week, McKenna preached an incredible sermon about the ways in which institutions, religious and otherwise, can devour the resources of vulnerable people in our midst. She shared Jesus’ anger, and his wisdom that these kinds of institutions, who claim to be charitable, but who perpetuate paternalistic, and condescending systems, that maintain the edifice of false piety and devotion, are coming down. In their stead, Jesus sets a different vision for how the world should be, where we follow the leadership of the widows, the woman in the story, who knows all too well the ways institutions can eat us alive, smiling all the while. And the way we get to the world as it should be, to this vision, is surprising, at least for me. The journey Jesus invites us on, It can be one of experiencing energy and renewal. Participating in the community of Jesus, it can be a process that leads us to feeling more fully alive, being in relationships that enrich us, where power is built through the gifts and stories and experiences of everyone involved, and no one feels the crushing weight of trying to keep things going. That’s a lesson my Father taught me growing up, about our resources of time and money. Our church was pretty rag-tag when I was younger. We had workdays to maintain the property, each family cleaned the church twice a year so we could save on hiring a janitor, and just about everyone volunteered to make this thing called church run. That’s been one of the many ways in which MPC’s history has, for me, felt like coming home. My Dad and I used to volunteer to do Janitor duty together, figuring my Mother had plenty to do keeping our home clean. And I found that I actually loved it, cleaning with him. He and I didn’t often find ways to connect, but something about mopping and cleaning toilets together, vacuuming and dusting the chairs, it is a memory I’ve always kept. Sure, it was service, but it enriched our relationship in a way that I didn’t think was possible most of the time growing up. I realized that serving with Church, sometimes it was a way to be joined to other people, even, God help us, other members of our families, in a way that was enriching. Years later, when I started attending our Youth Group, I got to see another side of offering. For years, our Youth group was led by our Pastor’s Wife, Cindy Nelson. Cindy never went to Seminary, wasn’t ordained, but she is just as much a Pastor as her Husband Thom is, just without the title. But when Thom and Cindy where called to another church, our youth group fell on hard times. For me, a closeted, nerdy kid in Suburban Oregon, Youth Group was the World as it should be, just for a little bit, each Sunday evening. It was a place where I could find belonging, and experience God’s love, in a world where I often heard lies about God hating people like me. When Cindy left, volunteer Youth Group leaders stepped in, but they just didn’t have enough time in their busy lives to be present with all of us, through all the challenges we were facing. Youth work, as so many of you know, takes a lot of time over cookies and coffee, french fries and on basketball courts, talking, and being present with our young people. So a group of parents and congregants were gathered, and were asked if they could make a serious financial gift to the church so that we could bring on a part-time youth worker. 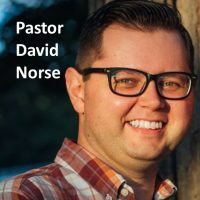 I never had known anything about our families financial standing, or our giving to the Church, and I was surprised when my Dad asked to talk with me after the meeting. He shared that he and my mother had been asked to contribute, and then he asked me about what I thought, what it would mean for me if we had, along with our volunteers, a dedicated youth minister. I don’t remember what I said, but I do remember what a gift it was, to receive from my parents, an investment in our church, that enriched my spiritual life, my sense of belonging. I realized that, sometimes, when we are asked to share our resources, it can so clearly align with who we are as a family, as a person, that it is a gift to be able to give our money away. High School was difficult, but sometimes when I would question my Father’s love for me, when I would go meet with our Youth Minister, there was always this reminder in the back of my mind, that he was helping to pay her salary. Deep down, I knew that, even if he didn’t understand quite how to show it always, there was love there. Friends, for some of us, sharing our resources can be a practice that grows us, and binds us to one another in powerful, surprising ways. It can be, oddly, easy to give up resources of our time, our money, it can be easy to build relationships to further the reign of God, in ways that enrich us, and not deplete us. Our reading this morning reminds us though that it comes from taking the time to develop relationships, for leaders in our community to listen, to take time to explore and discern what can be enriching to our souls, what can deepen the love experienced in our community, what opportunities to invest in our life together. And so, this Advent, and Christmas, January and February of 2019, and this Lent, I have worked with many of you to find ways that we can offer our time, our talents, our relationships to one another, to find ourselves enriched by sharing what we have, and finding ourselves fed where we are in need of support. And the Session, we have begun the process of creating a Stewardship Team, so that we can learn about the ways we can each be enriched through Stewardship, in all its many forms. Paul’s not the only one at work in the community we read about this morning. He has a team of folks who help him raise support for the work of the Saints. The community takes time to learn what people care about, where God is active in their lives and the community around them, so that their giving can be joyous, and enriching through the Power of God in our lives. Beloved, you will soon be receiving your Pledge Cards for our 2019 stewardship campaign. This year, I am asking that we pray and consider supporting the work of God through MPC by investing our resources in this place. We are at a crossroads, and now is the time to dig deep, if we are able, to move our world from the way it is, to the way Jesus dreams it will be, the way we dream it will be when we find it easy to be generous. These next three years are the time to be bold, to set us on a course of being sustainable for those in our wider community who are searching for MPC to be their spiritual home. These three years are a time to step into the ring, and be a part of creating a movement of neighbors and friends, moving our world more in line with the way the world should be, who are no longer able to let our world be the way it is. Now is the time to create a community where our children and our Elders can step into the dreams of our Ancestors, of being filled with Thanksgiving for what Jesus is bringing about in our personal, family, and communal lives. Beloved, this week, as you give thanks, I invite you to pray and consider how you can invest your precious resources of time, money, and relationships in Maryland Presbyterian Church. You will receive a pledge card, and you will also receive something known as an asset map. It is a way of being able to more fully explore how you might be called into pledging here at MPC. It has come from my meeting with so many of you this past year, and the needs our session has heard from you. It comes from hearing of the gifts God has placed in your life, in the depths of who you are, your sources of joy and creativity and promise. I would ask you to prayerfully consider how you are called to participate in MPC’s life in 2019. God is blessing us all through the life of this community, in new and exciting, and surprising ways. Let us bask in the ease that being church can be at times, when we have been prepared for such a moment as this.